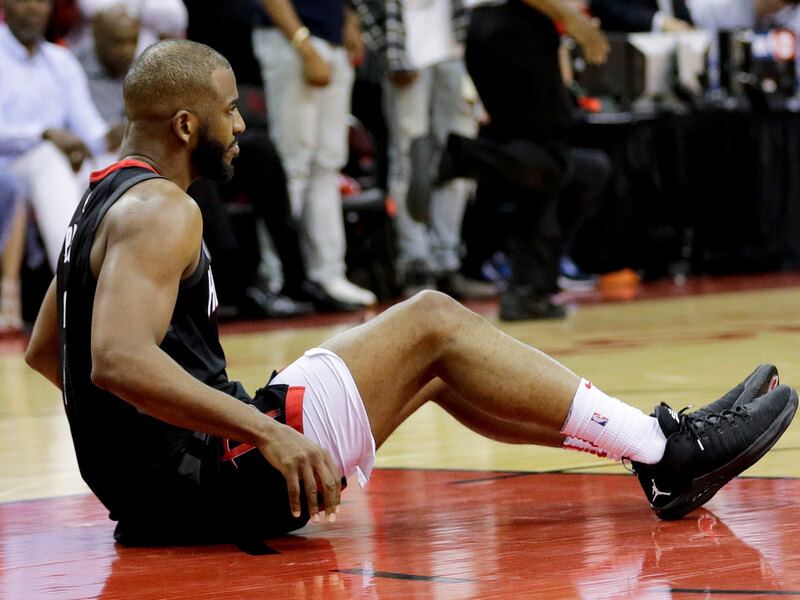 The Rockets are on the brink of eliminating the Warriors but face an uphill climb with Chris Paul ruled out for Game 6 with hamstring injury. HOUSTON — Chris Paul has spent a good chunk of his prime trying in vain to keep up with Stephen Curry. Just as a breakthrough neared his grasp, Paul fell to the court, clutching the back of his right leg instead. Four years ago, Paul’s Clippers barely survived Curry’s Warriors in a cutthroat seven game first-round series. Curry never looked back from that defeat, winning seven straight head-to-head match-ups with Paul, often in blowout fashion. While Paul continued to play at an elite level, he and the Clippers were surpassed on every front: Curry earned All-NBA First Team nods, Curry won two MVPs, Curry won two titles, Curry’s Warriors won the Pacific Division four years in a row, and Curry even snatched away the “NBA’s best point guard” title. This one-sided reality reached an apex in March 2015, when a pair of behind-the-back dribbles from Curry sent Paul stumbling to the Staples Center court and straight into a million memes mocking his unsure footing. Eventually, the specter of Curry’s Warriors forced Paul’s 2017 relocation to Houston too. Now here was Paul staring down Curry midway through the third quarter of the Rockets’ 98-94 Game 5 win over the Warriors on Thursday. He was seeking revenge, for those years of aggravating defeats and for Curry’s showy celebrations during these Western Conference finals. Operating in isolation outside the arc, Paul ran down the clock to less than two seconds and then stepped back into a deep, double-clutch, leaning three over Curry’s outstretched hand. The impossible shot swished through, and Paul immediately sought out Curry as the two players ran down the court. As Rockets fans cheered and the Warriors pushed the ball up the court, Paul made eye contact with Curry and pointedly shook his shoulders. Curry had shimmied in Game 3 and Game 4, and there was Paul, mere feet away, demanding that he answer for it. If Paul’s celebration could have talked, it would have said: “I might have lost my footing three years ago, but we’re standing toe-to-toe now.” Indeed, this shimmy was biblical—a shot-in-the-eye for a shot-in-the-eye—and a direct challenge to Curry: make me pay for doing this to you while everyone is watching. It’s been less than two weeks since Paul advanced to the conference finals for the first time in his career, but the knocks that dogged Houston’s fiery point guard for more than a decade already feel like ancient history. Paul has set the tone for Houston since its calamitous loss to Golden State in Game 3, fighting through a foot injury to hit timely jumpers and to play fierce defense, often battling chest-to-chest with Kevin Durant, who stands nearly a foot taller than him. If one player has embodied Houston’s transformation this season, it is Paul: He helps win games with defense, he is far too competitive to check out in tough moments, and he certainly doesn’t fear Curry and the star-studded Warriors. Rockets coach Mike D’Antoni told reporters that Paul predicted Houston’s stunning Game 4 victory before it happened. Paul’s fourth-quarter shot-making helped bring home Game 4, but his presence made the comeback possible. Houston doesn’t dig out of a 12-0 hole without Paul, who never blinked. Houston doesn’t survive Curry’s third-quarter flurry without Paul, who hit five threes of his own. The Rockets now hold a stunning 3-2 series lead over the defending champions, and Paul’s fingerprints were, once again, all over the Game 5 win. The nine-time All-Star finished with 20 points, seven rebounds, six assists and three steals, going deep into his bag of tricks during the fourth quarter to grind out Houston’s second consecutive ugly victory. While his gamesmanship, chirping and constant working of the referees have often made Paul a polarizing figure, his devotion to his craft is unimpeachable. He manufactured points from thin air and in close quarters, double-clutching a three-pointer over David West and banking in a wrong-footed leaner over Draymond Green. Even with James Harden tying a playoff-record by missing all 11 of his three-point attempts, Paul managed to keep Houston’s offense afloat. And, then, pure cruelty: As Paul attempted a turnaround jumper in the final minute, he came up lame, holding his right hamstring and walking gingerly. As if the foot injury wasn’t bad enough. D’Antoni pulled him from the game, and concerns about Paul’s hamstring issues, which limited him during the 2015 playoffs, immediately resurfaced. Paul did not formally meet with reporters after the game, and D’Antoni said only that his point guard would be re-evaluated on Friday prior to Saturday’s Game 6 in Oakland. That reevaluation determined that Paul will not play in Game 6, with his status for a possible Game 7 on Monday still undetermined. In the immediate aftermath of the injury, Paul wore the look of a man who had been there before. Indeed, the flashbacks to the 2015 playoffs were overwhelming: That year, Paul carried the Clippers to a triumphant Game 7 win against the Spurs in the first round, hitting a game-winner over Tim Duncan while playing through a hamstring injury that kept him out of LA’s next two games. That absence, of course, contributed to the Clippers’ infamous 3-1 collapse against the Rockets in the second round. Paul’s health now clearly stands as the fulcrum for this series. With Paul, Houston has a chance to gut out a fourth win and reach the Finals for the first time since 1995. Without him, Golden State’s margin for error widens significantly, as the Rockets have no obvious replacement for Paul on either side of the ball. This has been an unforgiving series throughout, with both teams’ offenses mercilessly hunting weak links. Under these circumstances, how healthy does Paul need to be to avoid being Houston’s biggest liability? An absent or limited Paul would have dire consequences for Houston, given that D’Antoni has utilized a constricted seven-man rotation. The Rockets’ out-of-the-rotation options include veteran wing Joe Johnson, stretch four Ryan Anderson, and defensive-minded forward Luc Mbah a Moute, but no one with the potential to replace Paul’s ball-handling and distribution skills. If Paul can’t go, Harden would have to carry an even heavier playmaking burden and Eric Gordon would need to score in even greater volume than he has during this series. There are some tough choices ahead. Should the Rockets try to play Paul under reduced minutes? Should they swap him into a reserve role in favor of Gordon? If Paul simply can’t find a way to play through the pain, should they angle for a “Willis Reed” type emotional lift during Game 7 at home? Although Paul’s injury creates so many unknowns for the next 48 hours, it also lays bare the stakes by erasing the middle ground. If Houston completes its upset, Paul’s contributions will stand as the greatest and most heroic achievement of his career. If not, the defeat will be remembered as the most painful twist of fate in an illustrious career that has been defined by both brilliant play and bad fortune.